Written more than 400 years ago, Hamlet still remains one of the most powerful, influential, and thrilling tragedies in the English language. 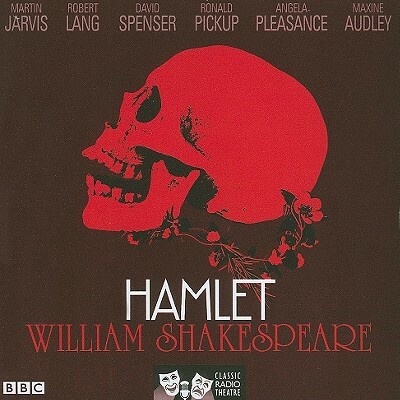 The story of Prince Hamlet and his quest for vengeance has been interpreted countless times on stage, film, and television. With its riveting plot featuring murder and supernatural horror, and presenting possibly the most fascinating character in the history of drama, it never fails to enthrall. This BBC archive production from 1971 was produced by the renowned John Tydeman and features a cast of highly-regarded actors, with music from the BBC Radiophonic Workshop. 3 CDs. 3 hrs 9 mins. William Shakespeare was born in Stratford-upon-Avon in Warwickshire, and was baptized on April 26, 1564. His father was a glove maker and wool merchant and his mother, Mary Arden, was the daughter of a well-to-do local land owner. Shakespeare was probably educated in Stratford's grammar school. In 1582 he married Anne Hathaway, and the couple had a daughter the following year and twins in 1585. Shakespeare's theatrical life seems to have commenced around 1590. We do know that he was part of the Lord Chamberlain's Company, which was renamed the King's Company in 1603 when James I succeeded to the throne. The Company acquired interests in two theaters in the Southwark area of London, near the banks of the Thames--the Globe and the Blackfriars. Shakespeare's poetry was published before his plays, with two poems appearing in 1593 and 1594, dedicated to his patron Henry Wriothesley, Earl of Southampton. Most of Shakespeare's sonnets were probably written at this time as well. Records of Shakespeare's plays begin to appear in 1594, and he produced roughly two a year until around 1611. His earliest plays include Henry VI and Titus Andronicus. A Midsummer Night's Dream, The Merchant of Venice, and Richard II all date from the mid to late 1590s. Some of his most famous tragedies were written in the early 1600s; these include Hamlet, Othello, King Lear, Macbeth, and Antony & Cleopatra. His late plays, often known as the Romances, date from 1608 onwards and include The Tempest. Shakespeare died on April 23, 1616 and was buried in Holy Trinity Church in Stratford.